Below is the essay ‘On Advertising’ by curator David Crowley from the exhibition catalogue for ‘The Poster Remediated’, 25th International Poster Biennial, Poster Museum, Warsaw. Professor David Crowley is Head of Critical Writing in Art & Design, Royal College of Art, London. Do you recall the adverts which you passed this morning on your way to school or work? If you took a bus or train, was it decorated with enticements to consume? Was that smart phone or fashion model in her underwear talking to you? Perhaps it said ‘Reassuringly Expensive’, ‘It is. Are you?’, ‘Its good to talk’, ‘Every little helps’, ‘What’s the worst that could happen?’, ‘You Shop, We Drop’ …. Sharing the common language of ad-speak, they all seem to blur together. Advertising forms our horizons, literally. As Arwa Mahdawi, in her essay in the Warsaw International Poster Biennale exhibition catalogue writes ‘Billboard advertising is far more intimately entwined with the architecture of cities. 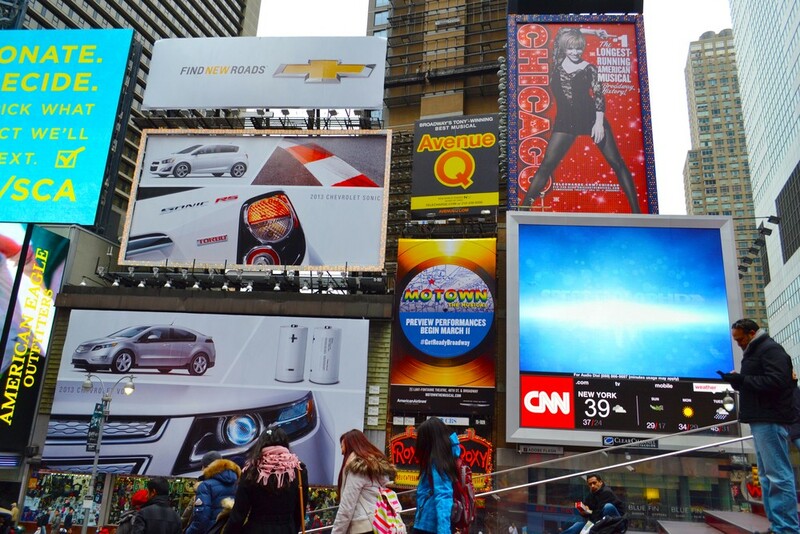 While in other media we can, to some extent, choose to consume ads, out of home advertising has melded itself inextricably into our environment’. 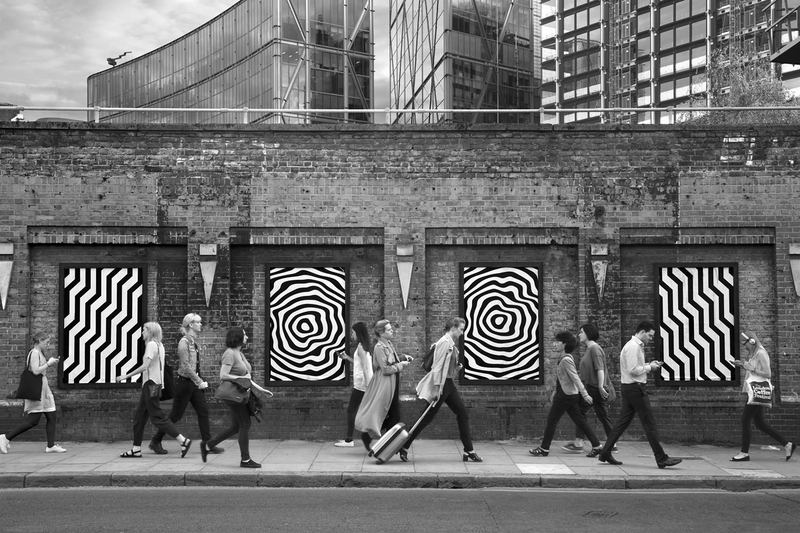 Increasingly, clocks, bus and tram shelters, and other parts of the information infrastructure in our towns and cities are supplied by a small number of global advertising companies in exchange for the right to fill our public spaces with commercial messages. And in an age when so many city authorities are strapped for cash, advertising income provides an indispensible source of revenue. Even those cities which announced their intention to do away with outdoor advertising – like São Paulo which introduced its Clean City Law almost a decade ago and removed 15,000 billboards and 300,000 oversized shopfront signs – have permitted its return, albeit in a controlled fashion. Sometimes it seems that advertising is so ubiquitous that it takes a conscious effort to see it. Or perhaps we simply have learned to block it out. But that too is a problem for anti-advertising activist and artist Jordan Seiler. ‘People say to me “I don’t look at it. I just don’t see it”. When I say “It is pretty much everywhere. How do you avoid it?” “Well, I just don’t look at those areas of the city”. That reveals to me that advertising is having a psychological effect, one which prevents us from looking at the environment around us – not just the walls but the people too.’ In other words, for all its spectacular promises and intimate messages, advertising – at least for Seiler – alienation and disconnect. And, unlike other forms of advertising on the internet or on television it is difficult to opt out of outdoor advertising. ‘We need to use public space to exist’, he says. Seiler is one of a number of artist-activists who engage in what is probably the most direct form of opposition to advertising. Donning high-vis jackets garlanded with the logos of the outdoor advertising companies, and using home-made ‘keys’, they open up the advertising frames and remove the ads. Sometimes they replace slick commercial messages with their own. 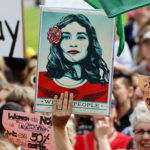 During the Climate Change Summit in Paris in November 2015, Brandalism, a group of anonymous activists mounted a substantial transformation of the city by commissioning dozens of large format posters from activists. 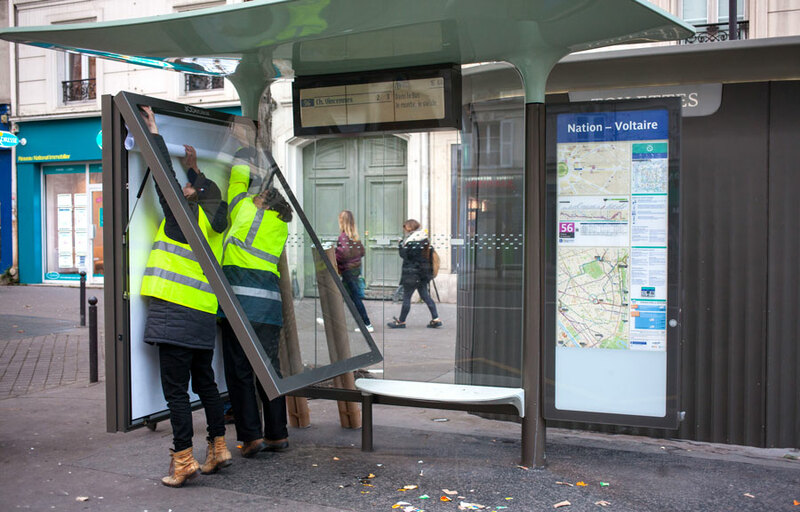 Around 70 people replaced the posters in around 600 bus stop shelters in the French capital. 82 artists from around the world supplied the images. Even though the city was on high alert because of the ISIS attacks which had taken place a couple of weeks earlier, the high-vis jackets did enough to lend their – probably illegal – activities the aura of legitimacy. Peter Kennard and Cat Phillips, London-based artists with a long history of using photomontage to make thought-provoking commentaries about the malign uses of power in the world supplied one of the designs. 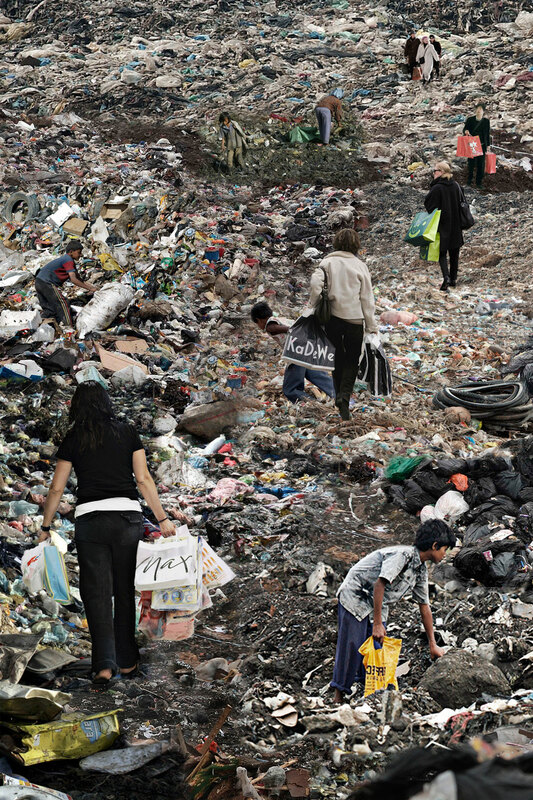 It combined an image of street children picking over a mountain of trash – a staple image of third-world poverty – with first-world shoppers carrying branded bags containing their trophies of luxury and fashion. Their point was simple – as political images ought to be – capitalism produces grinding poverty and excess on a global scale. Other posters produced for Paris, adopted the brand language and advertising style of car manufacturers and the air travel industry. They underlined Brandalism’s argument that corporate sponsorship of the talks was completely incompatible with their aims. 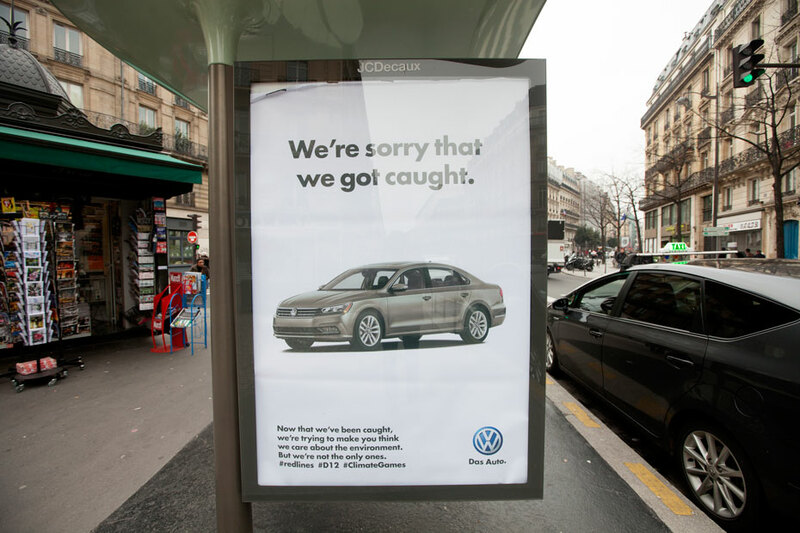 In their ‘We Are Sorry That We got Caught’ poster, Barnbrook, Klink and Friend accused the German car manufacturer of insincerity after it’s attempts to cheat the emissions tests on their cars were discovered. 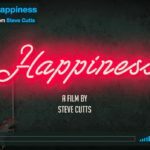 Darkly ironic, these spoof ads invert familiar messages – an effect which is all the more powerful when it appears in the frames of JC Decaux, one of the world’s largest outdoor advertising companies. Working in a similar manner, Vermibus’s attacks on advertising have a different target; the fashion and cosmetics industries. His ‘Unveiling Beauty’ series (2015) was made by following the trail of catwalk shows which are mounted in New York, Paris, Milan and London every autumn. Removing large format fashion posters, he then brushed solvents over the printed surface of each. Images smear and buckle; colours distort. He then returned them back to their frames. 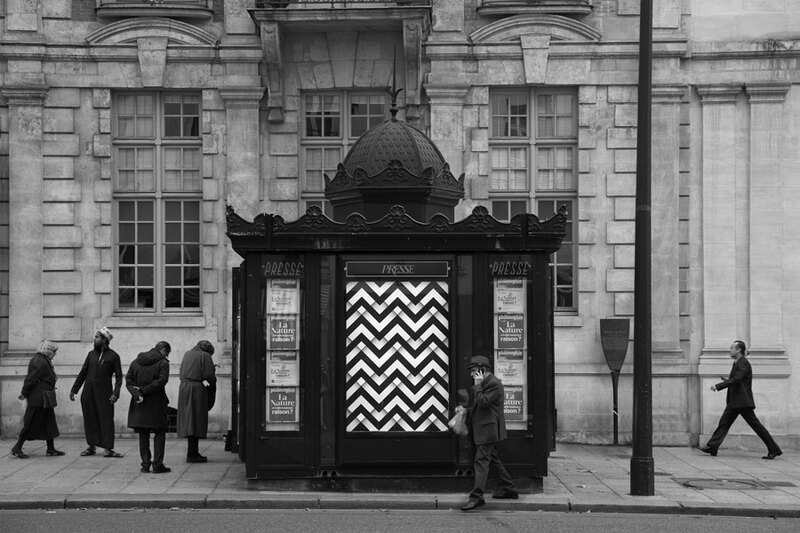 New York City based artist Seiler also switches posters, inserting his subtle geometric patterns into the illuminated advertising frames which populate the city. Often working with a concise vocabulary of shapes and coloxurs or with photographic images, Seiler’s designs draw attention precisely by not being shrill or arresting. Very different to the ironic framework which so much adbusting employs when it reworks and satirises commercial propaganda (not least the ads created by Brandalism’s artists in Paris), Seiler’s graphic images have a lyrical quality. A series of works entitled ‘Echo’ for instance, focuses on the New York City phone kiosk which has long functioned as freestanding frame for advertising. Using the technique of mise-en-abyme, Seiler, presents an image of the kiosk within an image of the kiosk within an image of the kiosk and so on. Seiler describes his working method: ‘I play a short game of cat and mouse in a phonebooth, installing one image, photographing it, then reinstalling that photograph once the original work has been removed. I do this several times until the original installation has undergone several iterations and is too small to see in the photograph.’ Here the distinction between inside and outside, and, by extension, of public and private on which the business of advertising relies (the public exterior of my building is my opportunity to command your attention) is disturbed. Unlike Vermibus and the Brandalism group, Seiler does not look for the protection of anonymity. He uses his own name and has been arrested on occasion for his activities: ‘When you are caught’ he says, the approach of the law, ‘is similar to graffiti – destruction of private property, possession of graffiti materials, intent to do damage above the value of $250 – which is a felony in the United States. But in terms of how I am dealt with by the cops, when I explain to them what I am doing, they are very understanding. They don’t treat me like a graffiti artist. I am not manhandled .. I am treated much more like an activist.’ Moreover, Seiler feels that because what he does not use anonymity, he has been able to escape prosecution, perhaps because the advertising companies do not want to give publicity to those who criticize their actions with great articulacy and, in Seiler’s case, great imagination too. Whether they are darkly ironic or suggestive and poetic, what, one might well ask, is the effect of these temporary interventions into our visual horizons? After all, they might only last a few hours or perhaps days before being replaced with glossy inducements to consume in the standard rotations. Perhaps the temporary nature of the intervention is precisely the point. None of these designs set out to form a replacement for advertising. They don’t present themselves as permanent solution to the problem of the occupation of public space by private businesses. Instead, they act like a small jolt in the steady flow of commercial messages which seem to wash over us all the time. Whatever one might think of the rights and wrongs of this form of outdoor hacking, it looks like it will have a limited future. 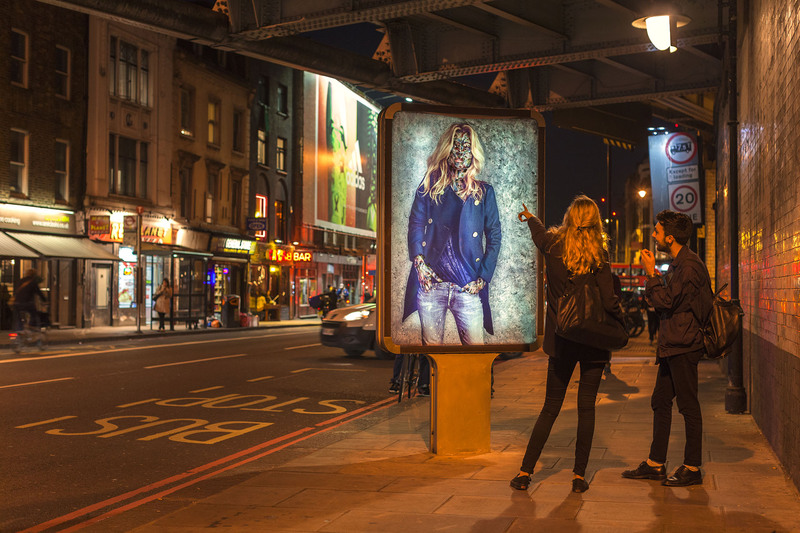 Increasingly the companies providing the advertising spaces in the city are converting their operations to digital billboards and posters. More than high-vis jackets, home-made keys and printed paper will be needed to replace the content of these screens. Posters from the Brandalism Paris Climate Talks Campaign and artworks by Vermibus and Jordan Seiler will appear in the Warsaw International Poster Biennale Exhibition ‘The Poster Remediated’ at the Poster Museum, Wilanów, 11 June-23 September 2016.